Yes AND No according to quantum uncertainty theory, if applied to macroscopic reality. The cat's state will not be settled until an observer looks inside. Q: Is the cat in the box? I thought you were removing the uncertainty by showing the claw marks. Yes, the cat is dead because it's been in the box since 1935. Question: is my cat still alive? Answer: yes and no, 50-50. Q: Is the cat alive or dead? A: Both - the box is still sealed. I LOVE this! Top 3 hopefully? Gibt es ein Katz? Ja wohl. Q: Is the cat alive? Is there a cat in that box? Nice lighting. I probably would have left out the claw marks, but you have to lead others fairly strongly or they'll miss the obvious reference. This was the best idea in the challenge, and to be frank, I'm kind of disappointed I didn't think of it having a PhD in physics. Answering the question we'd have to peek inside, but we'll only see one of the superpositions. Should be the winner as it is perfectly reflects the challenge. Also, it is so far beyond the average contribution in this challenge, it should win by default. We will never know ..
As a scientist, I like it! 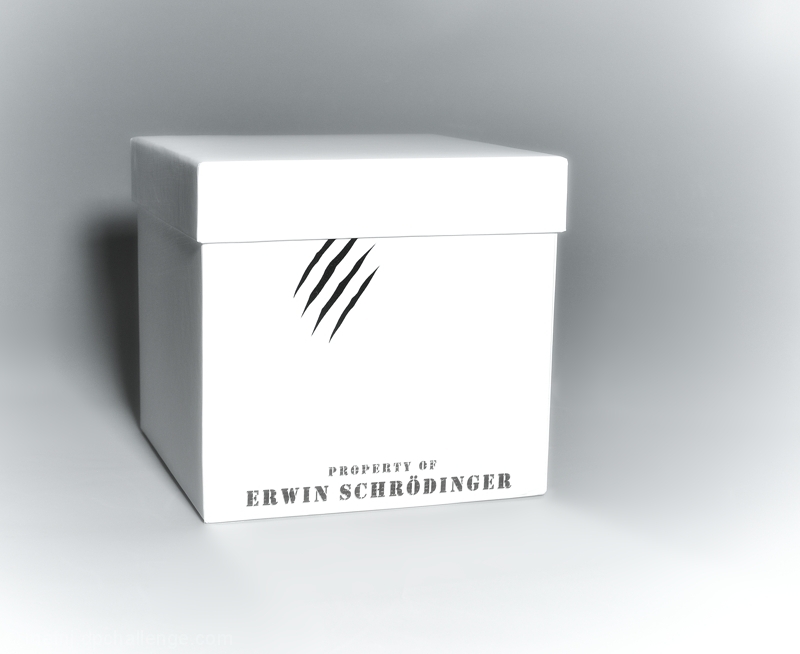 Question: Would Erwin bother to cut air holes in the side of the box if there wasn't something alive inside? Really like the simplicity of the shot, in addition to the curiosity it arouses. Q: Did you steal Schroedinger's Cat? A: No, It' might be in the box, or not..
HAHAHAHAHAH, LOVE THIS! Hope to see it on the front page. Q: Is it a cat inside? Proudly hosted by Sargasso Networks. Current Server Time: 04/21/2019 04:06:49 PM EDT.